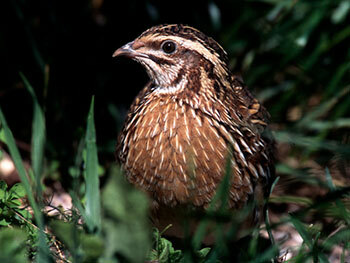 Quails are small birds, related to partridges. Although -at least in the Netherlands- they are called ‘game birds’, they are actually bred at farms for their eggs and meat. They make a beautiful dark stock. The small birds could be regarded as the replacements of even smaller songbirds that used to be eaten (and in some regions still are). 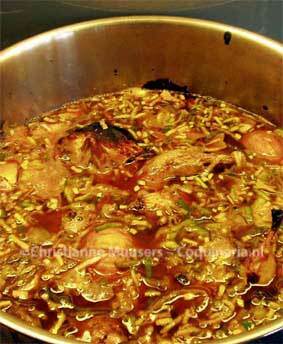 There are some links in the recipe to the tips & tricks of broth making. There you can find descriptions of how to strain, reduce, cool and keep your broth. Because that is the same for all broths and stocks, this information is gathered on one page. On that page you can also find links to other recipes for stocks and soups. For about 1 litre concentrated stock; preparation 45 minutes in the oven + 8 hours. To get a really dark stock, the quails are grilled with the vegetables in the oven. Place quails and vegetables in an oven casserole. Mix the tomato purée with the red wine, pour over the quails and the vegetables. Put the casserol into the oven for 45 minutes at 200 dgC/390 oF. Take the quails out of the pan, remove the flesh from the bones, return the carcasses to the pan. Use the quail meat for ragout, in a salad, or return it to the finished concentrated stock later. The cats will love to eat the skin of the quails. If you have used a small casserole transfer everything to a larger soup pan. Add water (four litres), bring to the boil and let simmer for eight hours. Strain the stock, and reduce to one litre, then let it cool quickly. Now you can freeze what you don’t need immediately. If you want to freeze the quail meat, add some of the stock to keep the meat succulent went it is thawed again. Do not forget to label your frozen stock, in the freezer all stocks look alike. To serve the concentrated quail stock as a consommé, dice the quail meat and return it to the reduced, strained and clarified stock, and add some dried, steeped black horn of plenty mushrooms (in French trompette de la mort) and a glass of portwine. Quail meat is also delicious as stuffing in home made ravioli: put in the blender, add spices and herbs (black pepper, nutmeg, thyme or something else you like), a little double cream, some grated Pecorino cheese, maybe some mushrooms, and wrap in freshly made pasta. 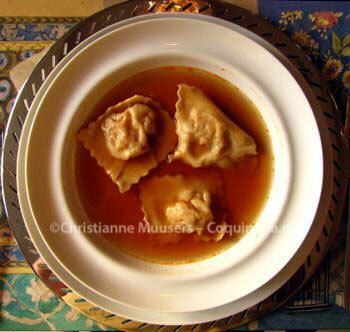 Boil the ravioli in salted water, serve them in some of the concentrated quail stock (not unlike tortelli in brodo), or with a cream sauce.